Since March is Trisomy awareness month, I wanted to share a few facts about the three most common forms–Trisomy 13, 18, and 21. 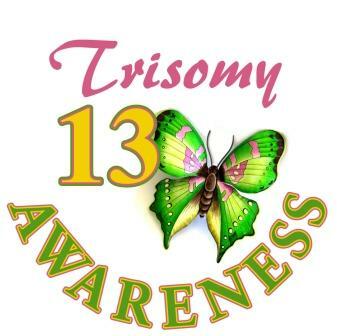 Trisomy 13 (also known as Patau syndrome) is a chromosomal condition that happens in about 1 in every 10,000 newborns. It is where there is 3 copies of the chromosome 13 instead of two (the usual). When the extra genetic material is attached to the extra chromosome it is called translocation. With this condition the babies statistically do not live past birth-1st month and if they do, they usually pass before turning one(Only 5-10% of babies live to be one). Trisomy 18 (known as Edwards’ syndrome) is a chromosomal condition that occurs 1 in every 5000 live births. It is more common with this condition, for the fetus to not make it to full term and pass in utero. With Trisomy 18, there are three copies of the chromosome 18 (instead of the usual two). With this condition, the child will most likely have several life-threatening medical problems, and due to these complications these babies normally pass before birth or within their first month. Only about 5-10% of children will live to their first birthday. Trisomy 21 (also known as Down Syndrome) is the most common birth defect in the United States. This occurs when there is an extra chromosome 21 (instead of the usual two). This condition occurs 1 in every 800 births, with as many as 6,000 children born each year. With this condition, 85% of children will live to their first year, and 50% of those people will live to be over 50 years old. If anyone would like more information, you can head over here.